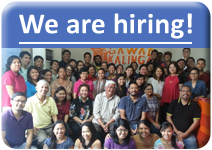 “Through Kalinga Politics (politics of caring), GK encourages every public servant, especially in the town-level, to be a father and mother to their poor constituents, and help bring services and development to those that need it the most." New Politics. With GK’s template of land for the landless, homes for the homeless and food for the hungry, GK works with local chief executives to bring concrete hope to the poorest families and provide basic needs to their poor constituents. It has allowed us to raise a new breed of leaders who place the interests of the poorest citizens at the heart of the country’s development, and this synergy between the private and public sector helps to restore faith in our leaders and generate hope across all social classes. Visible and Quantifiable Performance in Building Slum-Free Municipalities and Cities. Local Chief Executives are encouraged to develop their towns into models of development with tangible and visible results; inspiring greater trust and attracting greater generosity from different sectors of the society. The GK Way of building communities through bayanihan and padugo (to bleed for a cause) can also be extended into developing the entire town. Servant Leadership. First to serve, last to benefit. GK’s values formation among the community leaders challenges our partners in government to take the posture of a humble servant placing the needs of the poor on top of their agenda. The Local Chief Executives we work with have become models of integrity that bring about positive change and inspire greatness among their constituents.